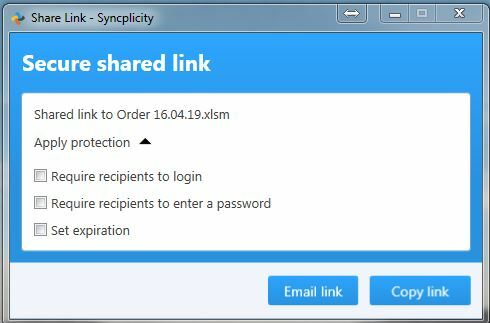 Right click on a file you want to send and select “Syncplicity” and then select “Share Link” from the Syncplicity menu. A new dialogue box will open with options to add a password and set an expiry date on the shared link. Note that you don’t need to add a password unless required. SOLVit would recommend adding a password and an expiry date to the link for security reasons. You can select Email Link to directly email the link to an end user or select copy link t paste the link into a custom email to send to the end user. Recipients simply click on the link and download the file.